I get the New York Times thrown on my doorstep every day. It’s one of life’s finer luxuries–I understand. Most of what’s in the paper is also online though there are some differences. 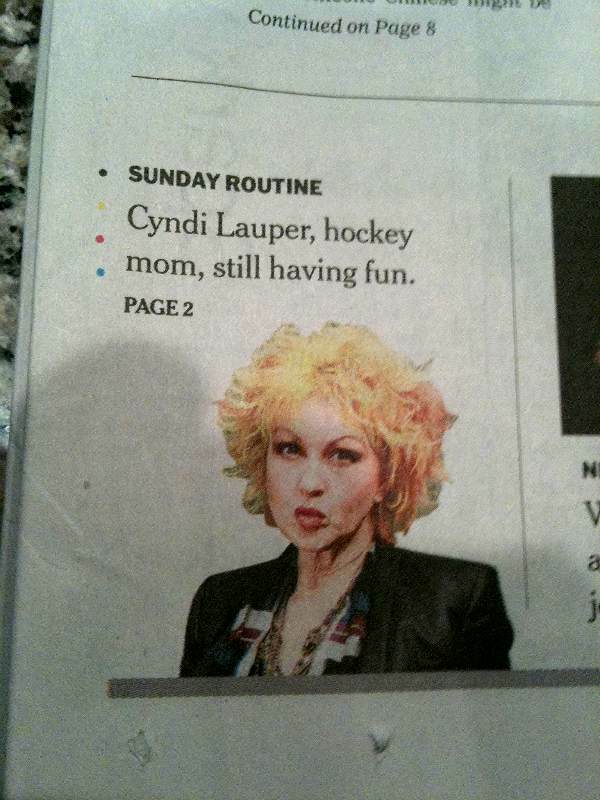 Cyndi Lauper, hockey mom, still having fun. Four words about Cyndi Lauper I never thought I’d see. Four words that mark the end of society as we know it. Nice NYT piece. I had the pleasure of spending a few hours with her in 2003. I sat next to her at a movie premiere, and she was extremely gracious. She is a very serious musician and artist- and quite normal! And a lot of fun! And still very much on the scene and as the article indicates, very happy. I understand. On stage is different than real life. However, are these the words you expected to see from the girl arguing with Captain Lou Albano in “Girls Just Wanna Have Fun” 26 years ago? I have loved Cyndi for 25+ years. I was so surprised at her attitude during Celebrity Apprentis. Yes I know she is an artist and yes, I know muscians are high strung and yes I know when you have that much talent like Cyndi or Barbra Streisand, you tend to come off as B*tchy. HOWEVER, sitting there and using foul language and acting like a 15 year old that was told she couldn’t go to the dance….WOW!